Which Real Estate Contract Is Right For Your Deal? A real estate contract is a document that legally binds two or more parties to agreements made during a real estate transaction. Contracts are an essential tool that help investors protect their investments and minimize risk. There are four different types of real estate contracts: purchase agreements, lease agreements, assignment contracts and power of attorney documents. If you’re new to the real estate investing trade, you may be wondering what a real estate contract is, and what the different types might be. What role do these real estate investment contracts play? And, perhaps even more importantly, what benefits do they provide investors? There are essentially four types of real estate contracts: purchase agreement contracts, contracts for deed, lease agreements and power of attorney contracts. They each have their different uses and stipulations. In this article, we will cover the different types of real estate contracts and give you the foundational knowledge to make informed investor decisions. What Is A Real Estate Contract? 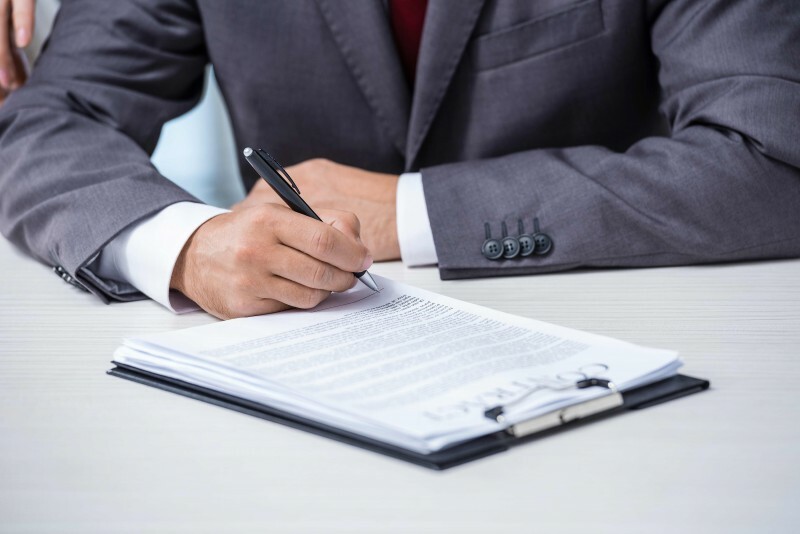 A real estate contract is a legally-binding document that outlines terms that were agreed upon when two or more individuals negotiate a real estate transaction. The terms outlined in a contract are put into effect upon signing, and typically include items such as real estate contingencies, what appliances are included, the deposit amount, who is responsible for paying closing costs, and the date of closing. As a real estate investor, you will find yourself negotiating and signing real estate contracts any time you strike a deal. Before getting into the dissection of real estate contracts, it will be helpful to review the common types of real estate transactions. Buying a home: As an investor, you will come across many properties that you’ll want to purchase throughout your career. You can work with a buying agent to help find potential deals through the MLS, submit offers on your behalf, and help you navigate through the purchase agreement. Selling a home: You will also find yourself selling some of the properties you had purchased, and hopefully at an increased value through improvements and appreciation. Your selling agent can help market your investment property to prospective buyers. Buying a property to rent: If you are interested in becoming a landlord and earning rental income, then you will of course purchase rental properties. This can range from single-family homes to multi-unit apartment buildings. Fix and flip: A fix and flip property is the type of investment in which you will typically acquire a property that is being sold under market value, such as a foreclosure or distressed home, and put in an investment to renovate it. Investors will typically then re-list the property on the market as soon as they can for an increased value. Wholesaling a property: A wholesaler plays an integral role of finding off-market properties and assigning the purchase contract to an end buyer, such as a rehabber. Prehabbing a property: A property is prehabbed is a type of exit strategy through which an investor makes minimal improvements to a property, just enough to make it appealing to another end buyer, such as a rehabber. Some might argue that prehabbing is a step between wholesaling and rehabbing. Serving as a lender: At some point in your investing career, you may build enough cash flow to the point at which you can serve as a private money lender to other investors. In this case, you will need to strike up an agreement with your borrower, such as the loan term and interest rate. This is the most common type of real estate contract. As the name suggests, this is a contract that lays out an agreement between the buyer and seller of a specific property. This type of real estate contract includes all the typical elements of a contract: purchase price, signatures, party identification, etc. In addition, it also specifies the closing date for the transaction. State/Association Purchase Agreement: Many states, and the realtor associations that serve local markets, have standardized purchase agreements they use to guide their transactions. General Purchase Agreement: This is a stripped-down, usually much shorter, version of the state/association purchase agreement. A great option when working directly with sellers, and not buying a property through a real estate agent. If you do prefer to use a general purchase agreement with an attorney or real estate agent, be sure to point why you want to use the agreement, and emphasize how it can save time for all parties. Property-Specific Purchase Agreement: If you’re buying a property outside the traditional single-family paradigm, such as a mobile home or piece of vacant land, you may need to use property-specific purchase agreements (this will depend on the market). Though there is quite a bit of similarity with these types of purchase agreements, these types of contracts do have certain clauses which pertain to the type of property being transacted. A real estate assignment contract is used, primarily, in a wholesaling investment strategy, in which you find a distressed property, secure it under contract and “assign” that contract over to second buyer (usually at a small profit to you). The “assigns” part gives you the opportunity to lock up a property with a purchase contract and pass along that property to someone else if you so desire. Though the extra words may not take up much ink, they do provide a tremendous amount of flexibility to you as an investor. Even if you’ve never purchased property before, chances are you’re familiar with lease agreements, or have signed one in the past. As one might surmise, these real estate contracts outline an agreement between the lessor (the property owner or landlord) and a lessee (the tenant). Agreements of this kind specify important considerations such as the rent amount, security deposit, how utilities are handled. It should go without saying that lease agreements that are intended to avoid future issues between lessor and lessee, and protect both parties in the event that something unforeseen happens. Though not used exclusively in a real estate setting, power of attorney documents are a form of real estate contract, and can be exceedingly useful in certain situations. This is because if you’re not able to sign a real estate contract, whether because you’re out of the country or because of some mental incapacity, this document gives another party the power to sign on your behalf. This type of real estate contract can be quite helpful if you’re the owner of rental properties or you are caring for an elderly parent, or relative, who may encounter a situation when they can’t sign their own real estate contract. A real estate contract doesn’t have to be overwhelming or confusing. A good, first step is to understand the types of real estate contracts available, how they benefit you as an investor, and the best situations for using them. Knowing this will put you one step closer to investing mastery. How well do you know your real estate contracts? Do you have some favorites of your own? Perhaps there are some you would rather avoid? Feel free to share which real estate contracts have influenced your career path the most in the comments below. You may find that great investors think alike.